Instructables is excited to launch the 2012 ReadySet "Off the Grid" Contest! For this contest we're looking for any project that in some way involves being self sufficient when it comes to standard utilities like electricity, water supply, and communication/data services. This includes, but is not limited to, wind, hydro and solar energy generation, power storage and battery banks, backcountry charging solutions, innovative and efficient heating and cooling solutions, and anything related to home-grown systems for internet or phone service that help you live your life "Off the Grid". We’re also looking for innovative or useful devices that can be powered by a USB port or a Car Lighter Adapter port. In short, if your project shows in any way how you've helped replace a utility scale service with a DIY solution of your own or how you’re charging innovative devices via USB or CLA ports, it's eligible and we want it entered in this contest! Be sure to check out Fenix International's Kickstarter page! We also launched a Fenix Intl group. Subscribe to the group to learn the technical specifications for the Fenix ReadySet so you can get an idea of the sources of power generation and applications they are developing. Multiple entries are accepted, but each entrant can only win one prize. Contest is open to entries from US, Canada [excluding Quebec], UK, China, Belgium, the Netherlands, Australia, Colombia, Germany, Switzerland, Norway, India, and Denmark<. Contest closes for entries at 11:59pm PT, September 5, 2012. The Off the Grid Contest is closed. Ten First Prize Winners will receive a Fenix ReadySet Solar Kit. One Judges Prize winner for the best Instructable that produces electricity (e.g. solar panel, wind turbine, micro-hydro kit). 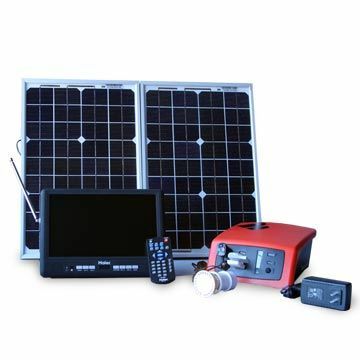 The winner will receive a Fenix ReadySet Solar Kit, a 10" LCD TV and a 12V-to-AC power inverter. Create a new Instructable that fits the guidelines outlined in the contest description above. To be eligible, Instructables must be published between Aug 1, 2012 and Sep 5, 2012 (11:59pm PT). Upon publishing your Instructable you'll see checkboxes for open contests. Select Off the Grid Contest. If you have entries currently eligible for entry, it will also show up by clicking "Enter this Contest" on the right side of this page. Sponsor. The Instructables Off the Grid Contest (the "Contest") is an on-line contest with skill, ability and knowledge components that is sponsored by Autodesk, Inc., a Delaware corporation having its principal office at 111 McInnis Parkway, San Rafael, CA 94103, USA ("Sponsor"), in connection with the Instructables service and website, www.instructables.com, (the "Sponsor Site"). The Contest is co-sponsored by the company or companies listed here, if any (each, a "Co-Sponsor"): NONE. The Contest is governed by these Official Rules (these "Rules"). For any questions regarding the Contest, the Sponsor may be contacted by email at [service@instructables.com] or by phone at (01-510-473-7626) or by mail at the address identified in Section B.18 ("Winner's List; Mailing List") below. Overview; Object of the Contest. The object of the Contest is to create an Instructables project involving utility scale service like power, water, waste, communication, heating and cooling which someone has re-created for themselves for their lives off the grid that meets the Criteria (as described in Section A.8 ["Judging"] below) and are submitted in accordance with the format, content and other requirements identified in Section A.5 ("How to Enter") below. All currency value references in these Official Rules are as indicated. First document your project in the (step-by-step, photo, or video Instructables format. Details regarding how to document your entry are available on the "How to Enter" section for the Contest located on the Sponsor Site. Winner Selection. There will be 13 total winner(s) for the Contest. The winner(s) will be selected on September 14, 2012, and Sponsor will announce the winner(s) on September 17, 2012. Each winner will be awarded only the prize(s) for which that winner was selected, as described below. One Grand Prize Winner will receive a Fenix ReadySet Solar Kit, 15 Watt solar panel, a 10" LCD TV and a 12V-to-AC power inverter. Power Generation Judges Prize: One Judges Prize winner for the best Instructable that produces electricity (e.g. solar panel, wind turbine, micro-hydro kit). 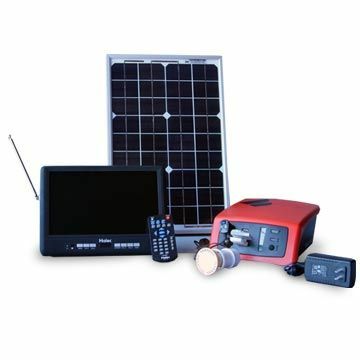 The winner will receive a Fenix ReadySet Solar Kit, a 10" LCD TV and a 12V-to-AC power inverter. Appliance Judges Prize: One Judges Prize winner for the best Instructable for an appliance that uses DC electricity (e.g. fan, UV water purifier, vaccine refrigerator). 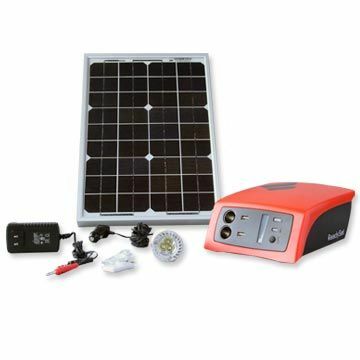 The winner will receive a Fenix ReadySet Solar Kit, a 10" LCD TV and a 12V-to-AC power inverter.